In honor of St. Patrick’s Day the WWE has released the very first clip from Leprechaun: Origins, the remake of the 1993 “classic” starring a young Jennifer Aniston. 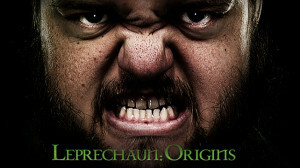 The remake is the first film in the series not to feature Warwick Davis as the evil Leprechaun, instead replaced by the WWE’s pint-sized wrestler Dylan ‘Hornswoggle’ Postl. Whether this film will be entertaining or not has yet to be determined, but I do like the approach that they are taking for this movie, which is a more darker and scarier take than the previous Leprechaun films that Davis appeared in. The original films became more comical as more sequels were made, so lets see if the WWE and ‘Hornswoggle’ can change that. I doubt it, but you can check out the first clip down below. Oh yeah, don’t forget to have yourselves a quick shot in honor of St. Patrick’s Day, and whatever you do… don’t steal a Leprechaun’s gold!